The Meigs County Sheriff’s Office 5th annual toy drive is now underway. Applications must be picked up and turned in at the Meigs County Sheriff’s Office beginning November 15, 2015 with application deadline being December 11, 2015. Since Sheriff Jackie Melton took office in 2010 and started the toy drive, with the generous help of the county, approximately 750 children in Meigs County have been able to have a Merry Christmas, and our goal this year is to see that number continue to grow. With the help of the citizens of Meigs County this program has become a huge success and a countless number of children have something to look forward to on Christmas day. You can bring new, unopened toys to any of our convenient drop off locations throughout the county or the Meigs County Sheriff’s Office. These areas will be collecting any new unwrapped toys from now until December 14th. Toys and games are needed for all ages from infants through teenage boys and girls as well as “stocking stuffer” type toys. No toy is too big or small. 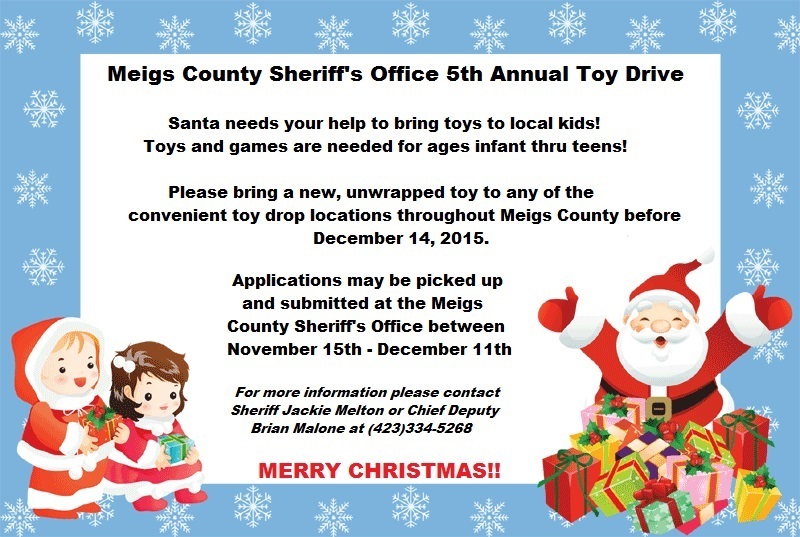 For more information or a list of toy drop off locations contact Sheriff Jackie Melton or Chief Deputy Brian Malone at the Meigs County Sheriff’s Office at 423-334-5268.